Felicia heard the helpful house elf shuffle to the window and close the offending window. “If one more owl flies through that window I’ll never get out of here,” she said speaking to Wilbur who was now standing by the side of Felicia desk wanting to see what he needed to do next. She looked over his head toward the stack of suitcases that were waiting for her to take on home on here summer vacation. “Wilbur would you be a dear and go get me another cold Iced Tea.” Felicia asked the trusted elf. “If I can’t be home right now, I might as well pretend I am.” Felicia heard soft pop and knew Wilbur had gone on his errand. There was a stack of parchments on Felicia’s desk that she still had to go through. It seemed like every day for the last 3 months there were an endless stream of owls dropping off order parchments from all the Professors and staff asking her to order items needed for their classes. She had orders for ink, parchment, books, herbs, flowers, books, quills, cauldrons, silverware, cleaning solutions, dragon hide gloves, and so much more. It seemed to Felicia that the Hufflepuff Professors ran out of everything at the same time. “Well, I have to get through this stuff so my vacation can start.” Felicia sighed as she reached for another parchment. She untied the yellow ribbon that held it together and then unrolled it. She began to read it and gasped. She reached for another parchment and repeated the process and sighed now. Twice more she reached for a parchment and started mumbling to herself. “Merlin, Merlin, Merlin,” but before she could say anything else, there was another soft pop and Wilbur was back with her drink. “Thank you,” she said to the elf before taking a long sip from the cold glass. Now that she had a moment to collect herself she looked down at the 4 parchments. Somehow with all the order parchments that inundated her office the last few months the Hufflepuff Spirit Awards had gotten mixed in. “I guess there’s an announcement to be made and since the students left for home already, maybe some owls to send out to let the winners know." Felicia whispered as she started to pen the proper parchments to do just that. Congratulations to the award winners! March Awards were - Bright Badger - Astaria Rivers bringing in 839 points! Badger by Another Name - Professor Gustavo Flores. Badger Setter-ers: Elena Galatas, Shadow Gaunt and Siobhan Sullivan. House Spirit Award to Astaria Rivers. 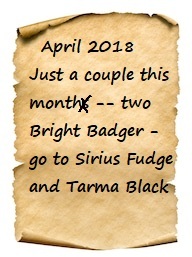 April saw Bright Badger go to Sirius Fudge and Tarma Black. May Awards - Bright Badger is Ingvild Ogden with 568 points - not only is she a first year, she's only been in HOL for 32 days as of the picking up of the points. Badger By another Name is Professor Scarlet Leslie-Lewis. Then to June 2018 and term end as well as regular awards ...Order of Helga - Hard Work goes to Meredith Malkins! In addition to everything else she did, she completed 12 OWLs and received an Outstanding in each of them! The Bright Badger goes to Katelin Ross. Hungarian Horntail goes to Kaitlyn Nightingale. Bright Badger - Professor Edition goes to Tarma. Then we have the Scholarly Badger awards -- those folks of each year who brought n the most points: First Year - Ingvild Ogden, Second Year - Kaitlyn Nightingale, Third Year - Arlynn Cassidy, Fourth Year - Cassiopeia Alamara, Fifth year - Meredith Malkins, Sixth Year - Jellicle Moon, Seventh Year - Katelin Ross and Post Graduate - our very own Belle Black! Well done, Badgers and BBaNs! PS - If you are wondering what these Awards mean - go read this post! Wow! That's a lot of parchments! Congratulations to everyone!